Pixelbomb’s debut title, third person shooter Beyond Flesh and Blood, will receive a majorly overhauled playable demo release at Play Expo Manchester, the team’s hometown. What’s a robot gotta do to find a pub around this place? 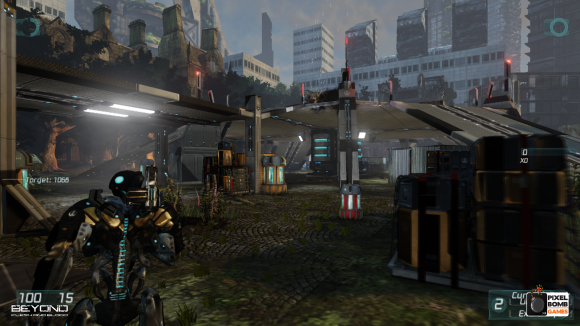 For a four-person studio Pixelbomb has taken on a big project in Beyond Flesh and Blood. A third-person shooter set in a futuristic Manchester UK, even the game’s Greenlight page is scarce on details about what exactly is going on as far as the game’s story is concerned. Instead, the dev team’s main focus when talking about the game has been on the visual style and the gameplay, arguably two of the more important elements of any game. The team initially offered up a playable demo of Beyond Flesh and Blood during the festivities at EGX London, where Pixelbomb admit they were very surprised by the amount of response they received. This time around they have more than just a tech demo for the game’s mechanics, though: instead, participants in Play Expo Manchester will get a chance to experience a solid vertical hour of the final game. This is the first look anyone will have had at the game’s narrative and how the gameplay and story of the game will intertwine, and the team behind Beyond Flesh and Blood are hoping to take any feedback they receive from the demo and turn it back into improving the game for early access release on Steam. Play Expo Manchester is an obvious choice for the reveal of the game’ demo: not only is it the game itself’s location, but it is also the home of Pixelbomb themselves. Playing from home field advantage will hopefully allow the game to draw a lot more interest and get people excited for the future of the project. As of yet no definitive dates are available for either the game’s greenlight or finalized releases. Initially set to come to PC and Linux, Pixelbomb also hope to bring Beyond Flesh and Blood to the PS4 and Xbox One at some point during 2015.